In this post Luca Spinelli and Ivan Aguilar from ClearPeaks indroduce us to the new export to Excel solution for Xcelsius using the Apache Tomcat (jsp) server. 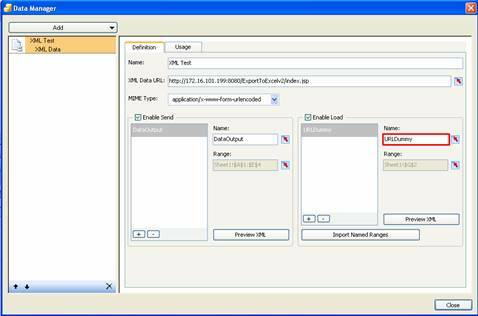 If you have been searching for an export to Excel solution for Xcelsius using the Apache Tomcat (jsp) server, look no further. ClearPeaks has developed a customized solution that any BI Developer can quickly and easily add to an Xcelsius dashboard. Export2Excel* will allow your end users to filter results by selecting part of their dashboard using the XML connection of Xcelsius. Essentially, this customized option adds flexibility to an Xcelsius dashboard for those users who want to look at data outside of the predefined dashboard components. 6. Check the “Enable Send” function. This will contain the range of cells that you choose to export. 7. Check the “Enable Load” function. Be sure that the Name is URLDummy (as highlighted in red in the screenshot below), and that the Range contains just one cell. This cell is the URL of the exported Excel file. As you will see in the image below, ClearPeaks has merged the functionalities of a refresh connection button and a URL button. As a result of this customized functionality, users can open an Excel file and begin their own analysis and comparisons if desired. If you want to learn more about ClearPeaks and our BI solutions, please contact us at info@clearpeaks.com or visit us at www.clearpeaks.com. * Copyright (C) 2009 ClearPeaks. This free solution can be used, published or redistributed with appropriate credit to ClearPeaks. Please see the terms and conditions of the General Public License within the “About ClearPeaks Export2Excel” tab of the file. Posted in: Add Ons, Excel, Introduction, Xcelsius 2008.
did you already download the latest version from our website (www.clariba.com)? By the way, if you face those issue with spacial characters then you should replace them in your excel. I know that it is a pity, but I will check whether we can do something and make it working. I hope I can get back to you soon with some good news…in the meantime you need to use find(replace()) in excel I am sorry :(! i have tried with find and replace.Please check my expression. but instead of returning %26, it is returning %2526. For more information, contact the file creator or your system administrator. I am working on an Xcelsius dashboard and have implemented this solution. My dashboard updates via QaaWS. That is, there is a drop down menu that, when the user chooses a new value, the QaaWS fires and the data is updated in my dashboard. This part is working just fine. I’ve been having mixed results using this export feature. When I click the Refresh Connection button, sometimes the data exports. Other times, I get that lovely 2032 error. If I keep clicking OK on the error and continue to retry to export, eventually it works (after about 6 more attempts at exporting). I have already updated the line of code suggested by Scott Lassiter. That was a big help. There are no special characters in my dataset at the moment so this isn’t the issue. (I know this because the export does work sometimes). I’ve read some conflicting comments that the culprit might be the crossdomain.xml file or that it might not be. For the record, I have not dropped this file anywhere on the server. I have officially run out of things to try. This feature is EXACTLY what I’m looking for so I’d really like to get it working consistently. Does anyone have any ideas on what else to try? Luca? Anyone else?? I used IBM Websphere and not Tomcat to deploy the business objects. Could you tell me the root folder where to put these files? We also getting the same errror below when refresh the XML connection. Appricate any advices on this regards. should I be worry for upgrades whether I use this solution? This is very good information. 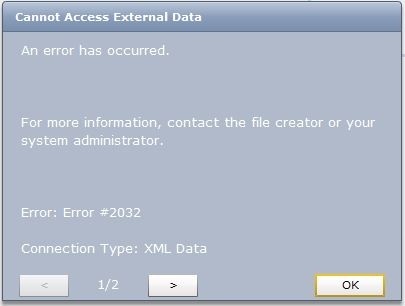 I tried to do the same but I am getting the below error if I am refreshing the connection in sap Dashboards. Can you please help me in solving the below error. I have kept the file in the tomcat folder so i can access directly the index.jsp file. but it is showing the file not found.